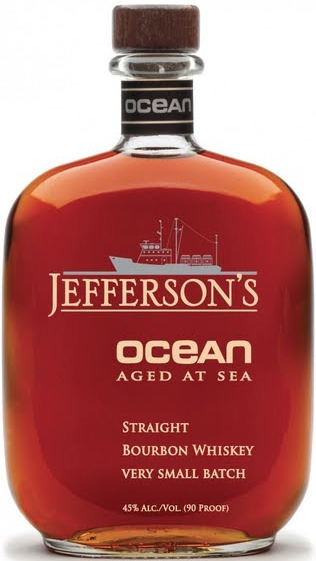 This bourbon started out as an experiment with just three bourbon barrels on Trey's friend, Chris Fischer of OCEARCH's ship, in a curious effort to discover what would happen if bourbon was left to weather the extreme elements: temperature fluctuations, salt air and the gentle rocking of the ship. The result was a thick, dark bourbon that showcases complex flavors reminiscent of other spirits; the almost black color and caramel flavors resemble a dark rum as the sugars within the barrels caramelized; the briny, savory taste from the barrels breathing the sea air is reminiscent of Islay Scotch; and at its core, it's a true bourbon. Due to a massive demand from consumers, Trey has now commercialized this experiment and sent hundreds of barrels around the world. Each voyage of Jefferson's Ocean typically crosses the equator four times, visits five continents and over 30 ports on an average sailing.